Fyber’s Hector Almeida, Senior Developer Relations Manager EMEA, was recently invited to Chartboost’s Berlin and London Roadshow to share his thoughts on the state of the mobile app ecosystem and tips for successful mobile ad monetization. Check out our highlights from the Berlin talk! Welcome Hector – can you speak a little bit to the partnership between Fyber and Chartboost, and what this means for developers? Hector Almeida: Certainly. First of all, I’d like to thank Chartboost for the invitation to their roadshow. We’re very excited to celebrate the new partnership between our two organizations, as this cooperation benefits publishers on both sides. 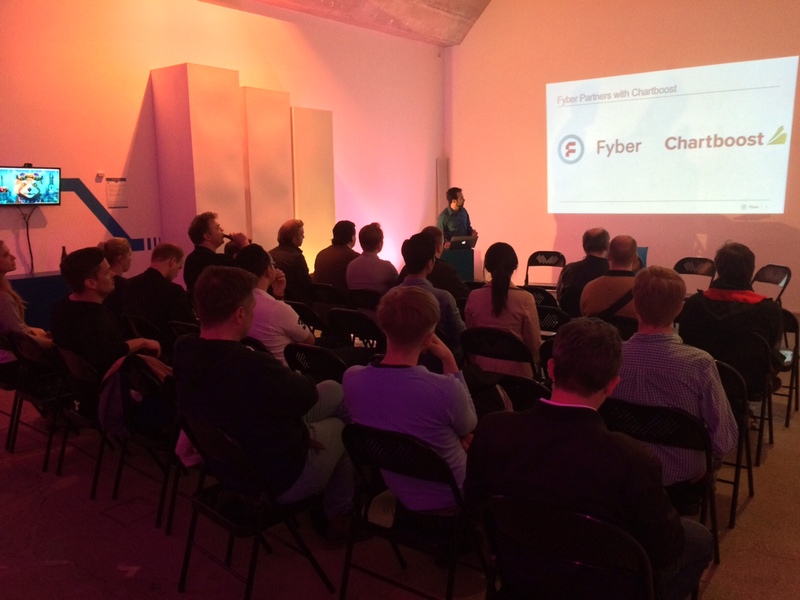 On the Fyber side, our developer clients are now able to add Chartboost to their network mix. Similarly, Chartboost’s publishers are able to mediate and optimize their traffic through Fyber’s mobile ad mediation solution. In both cases, the goal is to increase fill rates and eCPMs for our clients. With titles like Clash of Clans and Candy Crush ruling the charts for the past few years, is the era of innovation in mobile over? No, but the era of launching an app without a plan is over. In the past, developers could launch first, and then decide how to monetize on-the-fly. But nowadays, due to the increased speed that apps are brought to market, the stores are flooded with all kinds of titles that are competing for the same users. In addition, user behavior is also changing; Users are downloading and deleting apps in the blink of an eye. Publishers that don’t prepare a suitable monetization strategy from the get-go risk losing 50% of their users by the time they get around to implementing one. Plus, innovation might not come in the form of brand new concepts, but rather in adding new features that makes the game more fun: Weapons, boosts, animations, designs, social features, etc. This is something you should also consider hand-in-hand with your monetization strategy: Are there specific features or rewarding rules that could be implemented to maximize returns? Creativity is really the key to deliver more fun to the users. Should developers release multiple, varied games as a way to hedge their bets? This can work in two ways. Publishers like Ketchapp have focused on releasing an array of games and have been successful. Other developers decide to focus fully on one title and invest all their marketing and production efforts into it. At the end of the day, the key learning for developers is to understand when a game is not moving forward and try a new title. They should not spend too long trying to save a sinking ship. With limited time and money, how should developers choose which marketing channels to focus on? Paying for performance campaigns is in generally the safest way to invest, as you only pay for results. It’s also important to seek expert advice to guide you on prices and estimations, and ultimately ensure that your strategy will work for your goals. I would also recommend speaking with developers of similar apps to see what’s working and not working for them. How should developers evaluate their mobile monetization options? First of all, developers should analyze their audience: Where are their users coming from? What are their common interests, age, other demographics? Depending on these factors and the specifics of their game, developers should create a mobile app monetization strategy designed to complement, rather than negatively impact, the user experience. If a developer does decide to include advertising in their monetization strategy, they should next consider which networks specialize in the kind of traffic they have. A best practice is to use a mediation provider such as Fyber to easily integrate top networks like Chartboost, manage their overall traffic, and optimize every impression on a per user, per country basis to sell it at the highest price. How should developers analyze their players? They should analyze their users by country of origin, age, gender, interests, spending cohort (high/medium/low payers or non-payers), average session time, and most importantly, lifetime value (LTV). Once they’ve analyzed this data, the next step is to determine which ad network partners can best help monetize these specific user segments. Of course, if developers have any questions, Fyber’s team is happy to provide guidance and suggestions on the best performing partners for their traffic. In your opinion, what’s the biggest mistake that mobile app developers can make? Hands down, launching an app without an app monetization strategy and expecting that users will see and download it just because it’s good. With so many apps available, it’s hard to achieve visibility. Developers should create a viable UA and app monetization plan from the very start, prior to launch. Another mistake that I see is lack of demand diversification. Depending on your goals and the number of impressions you’re serving, a couple of demand partners may not cut it. It’s important to incorporate several ad networks into your demand mix – and these should be integrated from the very beginning, so that you can easily turn them on or off from your monetization dashboard. Remember, more partners mean more competition, which leads to higher fill rates and eCPMs. The last mistake that I often see is when a developer integrates ad networks directly without a mediation platform. The problem with this is that they can’t optimize between demand sources. A good mediation platform, like Fyber, will analyze each ad request and direct it to the partner with the highest-paying bid. Plus, all reporting is normalized and centralized through a single dashboard, and mediation saves hours of valuable resources with quick integrations and ongoing adapter maintenance. Thanks to Hector for his insights and to Chartboost for inviting us to their stopover in Berlin! If you have any questions on Fyber’s app mediation solution or the ad networks that we work with, please reach out to your account manager or to our Developer Relations team to get started.